September 5, 2016: Opportunity Gets in the Groove, Wraps Science Marathon Valley: Opportunity got in the groove at Endeavour Crater in August finishing the last of her science assignments in Marathon Valley, the Mars Exploration Rovers (MER) team prepared for departure, keen and so ready to drive into its tenth mission extension, and all was right with the world on the Red Planet. “We have a few more things we need to knock off, but we’re on our way out of Marathon Valley right now,” said Steve Squyres, MER principal investigator, of Cornell University, at month’s end. “Of course, there’s always the what-if-something-surprising pops up,” he added. Of course. That’s because MER is science driven. 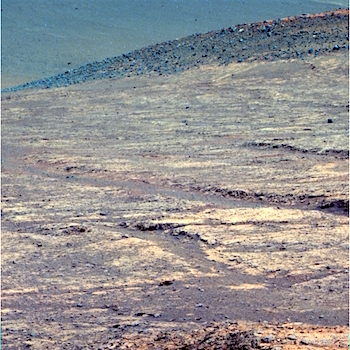 Opportunity was to finish taking the dozens of frames needed for an extensive color mosaic of Gibraltar_II, the most eastern segment of the Marathon Valley’s north wall the mission will visit, then tie up a few loose science ends, and rover on. But as the veteran robot field geologist was nearing completion of her work at the north wall, one of those what-if’s popped up. This entry was posted in Reports and tagged Cape Byron, Cape Tribulation, Endeavour Crater, Gibraltar II, Hinners Point, Knudsen Ridge, Lewis and Clark Gap, Marathon Valley, Mars Exploration Rover, Matijevic Formation, MER, Muffler II, NASA, Opportunity, Sleepy II, Wharton Ridge. Bookmark the permalink.